Omega general purpose AC motors are made by one of the leading motor manufacturers for over 45 years, a world-class accredited supplier with a long history of quality testing procedures and standards performed by the finest independent testing laboratories in the world. Our motors are made in high quality ISO9001-certified facilities using only the highest quality material and manufacturing processes. All motors are electrically tested in sub-assembly production and again after final assembly, and come with an ironclad 2-year warranty. Following are a few of the many reasons why our AC motors provide the best combination of quality and performance at the lowest prices. BEARINGS There are no sleeve bearings in our entire line of general purpose motors. We use nothing but heavy-duty oversized ball bearings on both the DE (drive end) and the ODE (opposite drive end). It is exactly for this reason that we can mount our motors in the "shaft up" or "shaft down" position with no derating. A shaft slinger keeps moisture and contaminants from the drive end bearing. And all of our AC motors have a high tensile strength steel shaft. END BELLS AND FAN COVERS All of our end bells are heavy duty burnished (polished) aluminum. Our fan covers are steel, not plastic. JUNCTION BOXES Our large, easy-to-wire junction boxes have rubber dust curtains designed to keep foreign particles from entry. These covers are designed to come apart at an angle to permit ease of wiring. Most motors are convertible F1 to F2 and all are rotatable at 90 degree intervals. Conduit holes are provided per NPT standards. MOTOR LEADS All of our leads are both color coded and numbered per NEMA MG1 Standards. NAMEPLATES Nameplates are said to be the "Window Of Quality" of a motor. Our AC motor nameplates are stainless steel to reduce corrosion and laser etched to provide permanent markings, and include an easy-to-read wiring diagram. PAINT We use an electrostatically applied, rust proof and scratch resistant paint. The paint almost seems to become part of the steel enclosure itself. CERTIFICATION Our motors are CCSAUS Certified. Note the US stamp. It means that our motor has not only passed the Canadian Standard Association requirements, but also the USA's UL and ANSI standards, thus giving them the highest certification standards you can have for North America. Our certifications also include CE and of course ISO9001. WARRANTY Our warranty matches the motors quality in that it leads the industry in guaranteeing customer satisfaction. 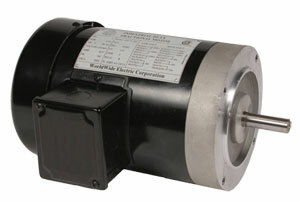 All of our AC motors have an ironclad two-year warranty and it is a nameplate-only warranty. That is to say, the customer sends us the nameplate and we send him a new motor. No paperwork - no delay - no waiting for credit based on a factory inspection - and no questions asked! Simply call our customer service department to obtain an AR number for the nameplate return.